Grains mixed in the overnight. Beans up 3 cents, corn down a penny, and wheat down 5 cents. Today’s chart shows the new-crop CBOT soybean/corn ratio, from the start of the prior calendar year, back through the 2011 ratio and including SX9/CZ9 so far since January. 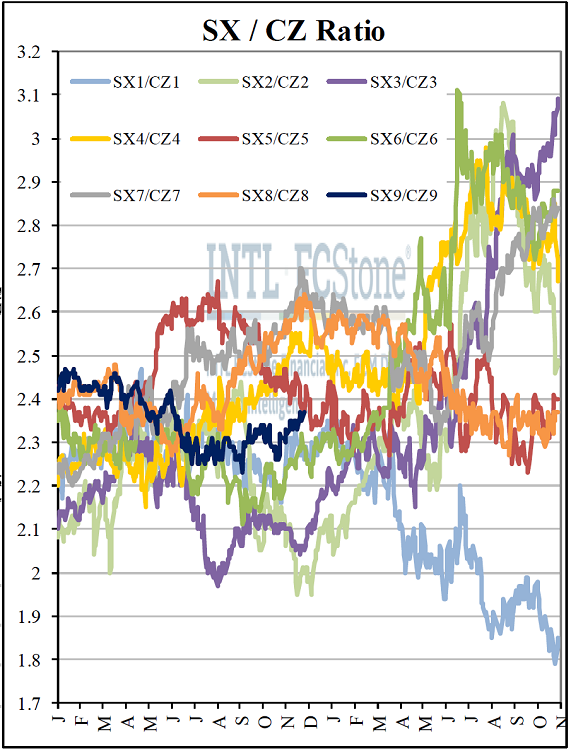 That ratio sits right in the middle of the last ten years’ general area, at 2.37-to-1; only once has that number been under 2-to-1 (SX2/CZ2 at this point in 2011), and only once as high as 2.7-to-1 (SX7/CZ7 in late 2016). Most expect the current ratio to work lower through the winter to discourage 2019 plantings, though that would be an abnormal move.